Chess GM Teimour Radjabov became the best athlete of Azerbaijan in July 2017. The winner of the third stage of the FIDE Grand Prix has gained 55 percent of the votes of azerisport.com readers. Next on the list are judoka Hidayat Heydarov (14 percent) and athlete Nazim Babayev (7 percent). Teimour Radjabov earned the title of Grandmaster in March 2001 at the age of 14, making him the second-youngest grandmaster in history at the time. 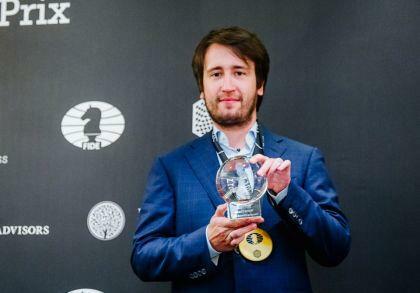 The Azerbaijani grandmaster claimed the bronze medal at the 2015 FIDE World Rapid Championship. Radjabov became the first player born since Kasparov first became World Chess Champion in 1985, to defeat him. Radjabov is also the youngest player in history to defeat a reigning world No. 1 in a game at tournament time controls. Judoka Hidayet Heydarov of Azerbaijan won bronze at the 2015 World Junior Championships in Abu Dhabi. He became European Cadet Champion 2013 (U60kg) and 2014 (U66kg). In 2013 he won bronze at the EYOF in Utrecht. Besides, he won bronze at the Grand Slam in Paris in 2017. In 2017 he became European Senior champion in Warsaw U73kg. Hidayet Heydarov is the only male judoka ever to win all four different European titles. Nazim Babayev specializes in the triple jump and long jump. In 2015, he won the triple jump competition at 2015 European Games in Baku. A month later, Babayev set a championship record, national junior record and world junior lead when he leaped 17.04m in the triple jump at 2015 European Athletics Junior Championships. Babayev qualified for the 2016 Olympic Games in Rio for the Men's triple jump.